The Neighbors Summit is a free and fun event which will help us connect with our neighbors, our neighborhoods, and our community. 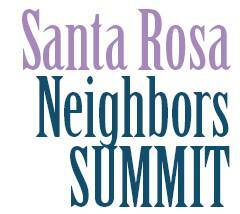 Join the City of Santa Rosa, Community Advisory Board, the Neighborhood Alliance, St. Joseph's Health System, and Community Action Partnership for the Neighbors Summit 2011 on Friday, August 19th and Saturday, August 20th. Come hear Amalia Alarcon de Morris, head of Portland's Office of Neighborhood Involvement and national leader in the work of strengthening neighborhoods and communities share best practices and ideas for making Santa Rosa an even better place to live. Join us for a day of workshops by neighborhood leaders on how we can build and strengthen neighborhoods right here in Santa Rosa. We'll also talk about how we can better partner with the City, business leaders, NGOs and others to improve the partnerships we need to build our neighborhoods and city. We'd like to know if you're coming to this year's summit and which sessions you're most interested in. Please help us make this a great event by sharing your thoughts. Click here to view the list of workshops and RSVP.